Felley priory was founded as a house for the Augustinian order in 1156 by Ralph Brito of Annesley. The priory was initially a cell of the larger house at Worksop, but achieved its independence in 1260. 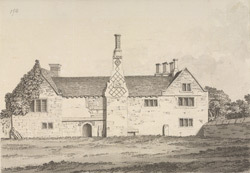 The priory was dissolved in 1536, after which it became the property of William Bolles and a private residence. The house seen here was built after the dissolution of the priory and the monastic buildings have disappeared - there are gardens covering the chapel. Very little of the medieval framework remains.